Soldier, administrator, orientalist (1879-1953). INSCRIBED by Jarvis on the titlepage "C.S. Jarvis/ For:- June & Eric/from Claude/29:4:43". WITH: 2 substantial Typed Letters Signed, 2pp each, 4to 1943 and 1952, sl crumpled, in the discussing his books (incl. [ Communist Party of Great Britain. ] Duplicated Typescript headed 'Discussion Statement prepared by Middle East Committee', and titled 'Imperialism and Economic Background of Egypt'. [ Communist Party of Great Britain, London. ] International Committee, 16, King Street, London, W.C.2. 26th March 1946. 5pp., 8vo. On five foolscap leaves, with duplicate copy of p.4 present. In good condition, lightly aged. [Harry Hall of the British Museum, Egyptologist.] Portrait photograph by Swaine of New Bond Street, with a second more relaxed portrait showing him with hands in pockets. The first image: 'Swain, 146 New Bond St, W. [London] and at Southsea.' The second image unattributed. Both prints black and white, and in good condition. The portrait shot is 14 x 9.5 cm, on grey card backing, within a 30.5 x 20.5 cm folder of the same grey card, printed with the name and address of the firm. The image depicts the head and shoulders of a moustachioed Hall, who is glancing to his left side with a faraway look in his eyes, while smartly dressed in dark jacket and waistcoat. [Sir Charles Trevelyan, as Assistant Secretary to the Treasury.] Autograph Note Signed ('C E Trevelyan'), requesting 'three more copies of my Egyptian Paper'. Place not stated [Whitehall, London]. 8 March 1845. 1p., 16mo (14 x 12 cm). In fair condition, lightly aged and worn. Reads: 'Pray send me three more copies of my Egyptian Paper | C E Trevelyan | 8 March 45'. [Pierre Crabitès, American judge of the Mixed Courts of Egypt.] Two Autograph Letters Signed to Wortham to H. E. Wortham, on their both publishing biographies of Gordon of Khartoum. Letter One: Mixed Tribunals, Cairo. 31 December 1932. Letter Two: on letterhead of the Tribunal Mixte de Caire, 28 April 1932. Both items in good condition, on lightly-aged paper. Letter One: 2pp., foolscap 8vo. The letter begins: 'Dear Wortham: | I had no idea years ago when you were in Cairo, that 1933 would find us issuing "Gordon" books. G.P.G. Sobhy, editor, Professor of Coptic & Demotic Languages Egyptian University. pp. 5, 259, 4 p.,  leaves of plates : facsims. 8vo, stifish card covers, sl. grubby, spine worn, contents good. Numerous typos (e.g. Puplisned by the University of Egypt). INSCRIBED by the ditor With the respects of GPG Sobhy | Oct.20th 1928, who has added M.D. to his printed name. Three copies listed on COPAC (Glasgow, Oxford, UCL), and a number on WorldCat/OCLC (12 USA, 2 German, 2 Dutch). Three Autograph Letter Signed (all 'Eric') from Sir Eric de la Rue, 3rd Baronet, one to his father and two to his sister Diana, written during the Second World War as a Captain in the Notts Yeomanry, Middle East Forces (Egypt and Benghazi). Letter to his father: 17 March ; 'H.Q. 215 Town Mayor M.E.F.' Letters to his sister: 4 May  and 4 October . Both addressed from the MEF. All three are air mail letter cards. Each with 'Field Post Office' postmark and censor's stamp. The three in fair condition, lightly aged and creased. 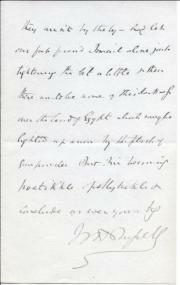 Letter One: To his father, 17 March . Addressed to 'My dear Father', with the envelope addressed to 'Sir E. de la Rue Bart. | The Sol | Cookham | Berkshire | England.' 1p, 4to, and 1p., 12mo. A light-hearted letter, in which he jokes about his father's inability to read the word 'Aviv' ('I suppose a series of "i"s and "v"s is rather difficult even if printed') and find the place on the map ('it is much larger than Bournemouth'). [The Bee Kingdom Leaflets No. 19] Swarming and Its Control. H. J. Wadey [Herbert James Wadey], Editor, 'Bee Craft', England, Vice-President, B.K.L. 'REPRINTED | From the "BEE KINGDOM" | May, 1938'. Published at 60, Rue Menasce, Alexandria, Egypt. 12pp., 8vo. Stapled and unbound. Fair, printed on browned high-acidity paper, with some creasing and wear at foot. No copy of this offprint in the British Library or on COPAC.